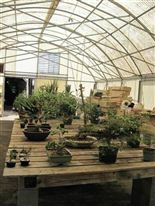 Whether you're a beginner, an intermediate hobbyist, or an expert collector, Flower City offers you a variety of choices from pre-bonsai, to bonsai, to top-notch specimen trees. In other words, we make certain you will find the perfect bonsai tree to suit your needs. If you are unfamiliar with these terms and in order to define them, it may sound funny but, perhaps it is best to start with the basics and ask: What is a tree? By definition: a tree (when mature) is a plant having a permanently woody main stem or trunk covered by bark, ordinarily growing to a considerable height, and usually developing branches at some distance from the ground. A bonsai by our definition then, is in fact any tree or shrub that has the appearance of a mature tree while at the same time being kept small enough--to be healthy--while growing in a pot. 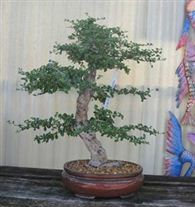 As a matter of course, such a tree would have undergone various (sometimes drastic) training procedures and techniques to have arrived at this miniature tree state. Normally, and with almost every species, this takes a period of several years! In addition, careful attention would have been paid along the way to insure that each developing bonsai, adheres to various time honored standards and principles normally associated these days with the art world. Like any creator of any "masterpiece" in fine art for example, any serious bonsai artist knows the ultimate purpose of his or her tree is simply...that it is meant to be viewed. As such, a good bonsai like other works of art should convey a sense of balance, eye movement, a point of interest within the overall composition, and careful attention should be paid (in particular) to the relation between line, form, and shapes. As trees take years to grow, so then, do these principles to apply! 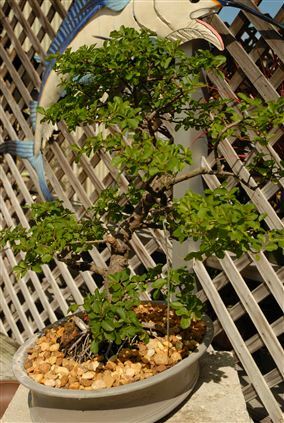 A "pre-bonsai" then, can loosely be defined as a tree or shrub that is living in a larger non-bonsai pot that has also already undergone some preliminary training. That is to say, some or even many of these techniques may already have been brought to bear and the initial 'rough' less definitive framework for what the tree may eventually become has already become apparent. 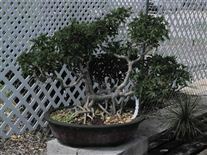 Finally, a specimen bonsai tree is one that has reached a level of refinement (and likely, excellence) that the various techniques used on younger trees are either no longer needed or in fact, no longer apply at all. If you looking for real value and--DO--have an interest in bonsai, just know that in small shops and big box stores alike, you will be offered your pick between three or four species with as few as one or two of each being available to you to make your selection. In other words, you may very well have a total of as few as six or eight juvenile plants in pots to choose from despite the fact that hundreds of species can and do make excellent bonsai. Unfortunately, we have listed more styles of bonsai than our competitors even have trees and we haven't even begun to discuss the various time honored techniques used that dramatically effect a tree's appearance yet! 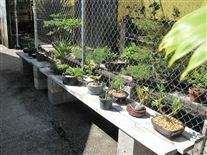 The sad truth is that when such places do offer "bonsai" and on the rare occasion they are not really just regular plants in fancy pots, these stores carry one style only, the very basic and most common informal upright. As they only handle one or two each of the three or four species based on their suppliers success rate of cramming them into small pots, one has to ask before buying, how many of these eight or so "trees" are actually showing any signs at all of vigorous healthy growth? Over the years we learned to identify and avoid these types of assembly line suppliers and have searched out instead, reputable competent growers who share our dedication and respect for this ancient art form. One visit to Dennis bonsai gardens will tell you instantly you that he is not interested in duping anyone with fast-buck short cuts!